Busy week here! I am currently finishing up my presentation for the Women's Forum at the National Bike Summit. If you will be there for the forum or the media training on Sunday I hope we can meet. 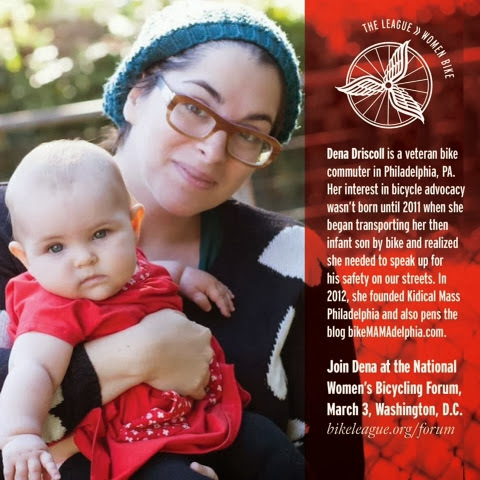 I am speaking about family biking and specifically Kidical Mass Philadelphia. I get to present with other great female leaders and Kidical Mass Arlington! Yeah family biking. PS: We are transitioning J very soon to the Yepp with a custome bracket for Urban Arrow and then the regular holder on Halsted. Helmet advice and the next stage of baby on a bike coming over next couple of week.